About Us - Old Glory Gun Safe Co.
You own guns and currently store them in a drawer or closet. You also have uninhibited young children who play and explore in proximity to those guns. This makes you nervous. Very nervous. So do thoughts about thieves breaking in and stealing your guns. Likewise, thoughts about what would happen to your guns were a fire to break out and engulf your drawer or closet in flames. It’s because you have guns profoundly vulnerable to unintended access, theft, and destruction that Old Glory Gun Safe Company exists. Our goal is to provide you with unrivaled firearms security and safety in the form of state-of-the-art gun safes and vaults, new and used, along with incomparable service support no matter where in the United States you live. 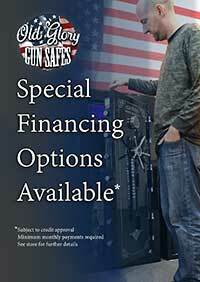 We’re also committed to redefining affordability when it comes to gun safes and vaults. We take exceptional pride in knowing that your gun collection stored inside one of our gun safes or vaults is accessible only by you—and only when you want or need that access. Old Glory Gun Safe Company began in the year 2010 although remained small until 2015 becoming a nationwide provider with national logistics, indoor delivery and customer service network. From a humble beginning in a small manufacturing facility, we have grown to become a thriving operation that now is a trusted favorite among sportsmen, law enforcement officers, the armed forces, and others who own and store guns. We earned that trust through our unwavering commitment to design, manufacture, and sell supremely tough and reliable gun safes and vaults constructed using advanced steel technology and engineered to meet our exacting standards of quality. Today, Old Glory Gun Safe Company is an employee-owned American company, part of the Ridge Runner Outdoors LLC family of brands, and proudly operating debt-free. Old Glory Gun Safe Company is led and staffed by gun enthusiasts who cherish the Second Amendment and all that it stands for every bit as much as you do. The people behind Old Glory Gun Safe Company are passionate about protecting your guns. They bring to their roles within the company many years of experience in the gun security industry. Most significantly, our team is accessible. When you dial us on the phone, you speak directly to a real, live person—not an automated call-handler system. We know you have questions about gun safes and gun security. We’re here to answer them. You can reach us at (877) 411-3600. Our gun safes work—and they work when you most need them to work. When you put your guns in one of our safes, you can do it with complete confidence that those firearms will still be there the next time you go to retrieve them. Securely locked inside your gun safe, your guns won’t accidentally find their way into the hands of your young children or grandchildren. Would-be burglars will be frustrated beyond belief by their inability to jimmy open the door. Flames can lick the outer surfaces of your gun safe for a long time and nothing will happen to its contents. In an emergency, when seconds matter, you’ll be able to quickly access your guns if needed to defend your loved ones and your possessions. In a world of cheaply made, mass-produced everything, Old Glory Gun Safe Company stands out as a true exception. Our gun safes are made one at a time, to rigorous standards of quality that most other domestic makers of gun safes can’t even begin to duplicate. We know you worked long and hard to earn the money to buy the guns comprising your collection. It’s for that reason we ourselves work long and hard to make sure the gun safe you purchase from us is built to deliver the performance you demand—and then some. At Old Glory Gun Safe Company, we’ve tested all types of locks to identify the very best. We’ve assessed digital locks, spin-dial combo locks, key locks, magnetic locks, and even EMP-proof biometric locking systems. What we discovered is that each type of lock offers its own novel strengths and limitations. With the aim of protecting your guns while ensuring your ease of access, we decided that the best lock for our safes is the digital type but with a unique-key manual override capability. We determined that this particular lock can give you lightning-fast access and a zero-percent chance of ever being locked out (especially at those times when getting into your gun safe is a life-or-death matter). We configure this lock to also include keypad backlighting because the last you want in the middle of the night when you hear a prowler is being forced to turn on a room light in order to see the numbers on that keypad. Gun safes typically come with seven locking bolts. These are easily defeated with a crowbar, as many a YouTube video demonstrates. Not so with our gun safes. Our doors are designed to withstand pry attack. How? By employing four-way bolt coverage in the form of (20) 1.5’’ locking bolts arrayed on four sides of the door. This practice endows our gun safes with an exceptionally high level of door security. Speaking of door security, there are many ways to build a bellhouse-contained action to operate the gun safe's boltwork. Seldom used by other companies is our approach, which features gear-driven boltwork made of stamped precision parts. We embrace this design methodology because it yields long years of smoothly functioning operation. Once it takes hold, your gun safe’s door can no longer properly close—especially if you try to utilize the door’s built-in storage shelves. Old Glory Gun Safe Company builds gun safes free of door sag. The secret is the addition of a third hinge. Three hinges are standard in every one of our gun safes. Old Glory Gun Safe Company promises never to sell your information to anyone or to any outside entity.